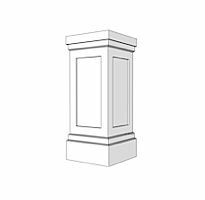 Non-Tapered columns can easily be made to fit any application. Standard units are sold in 2 foot intervals, measure the height needed then cut on site. Make sure that the inside dimension is wide enough to clear the support post. Next as shown in the illustration, check the footprint or the outside dimension, include the shaft and the thickness of your base of choice. 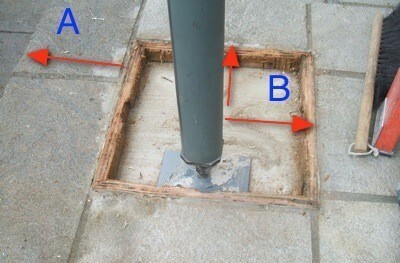 Make sure that the wrap will not hang over the patio (A) and that it will cover anything that needs to be covered (B). Other considerations are purely decorative, see the links below or the ordering guidelines for your column of choice. Remember, we have experts standing by that are happy to help. Non-Tapered columns are easy to measure, just choose the next size up and cut down to suit. The only other consideration is the inside dimension, it should be large enough to clear the supporting post. Choosing a Tapered a PVC column wrap requires four considerations. 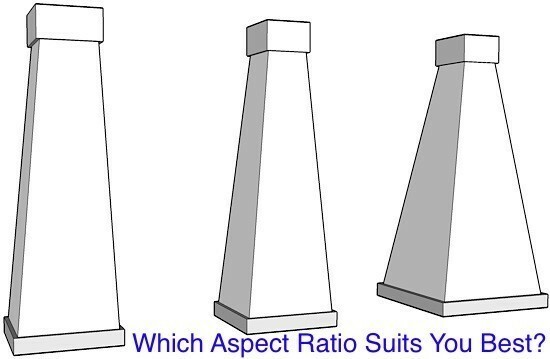 Choosing the best looking aspect ratio for the column. You may want to draw your column out on a sheet of cardboard to better visualize the effect that various combinations of sizes has on your specific aspect ratio. 1. Determine height of the shaft. 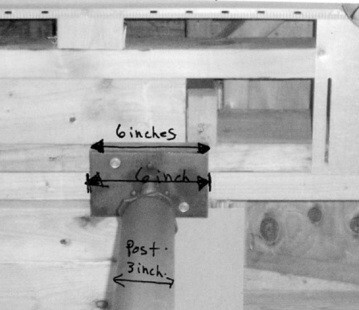 Measure on site and remember that you have 1 or 2 inches that will be covered by the cap. 2. The top shaft dimension. The industry standard of the top shaft measurements are 6", 8", and 10" square. When choosing between these three, the inside dimension should clear the support post, and for the top outside dimension, add the thickness of the Capital to the shaft. Ideally, the Capital should not extend beyond the rain gutter or roof line. 3. The bottom footprint with the base included. 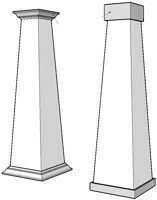 In most cases, the wider the base, the better the column looks. Keep in mind that the bottom shaft size will be limited by the size of your pedestal and the thickness of the decorative base. The Georgian or Craftsman Base is the thinnest, which allows for the maximum bottom size. The bottom footprint, which includes the base, should not exceed the ledge or the patio. The bottom shaft size can be customized if need be. The inside dimension should accommodate the existing support structure or post. 4. The Capital and Base Set. 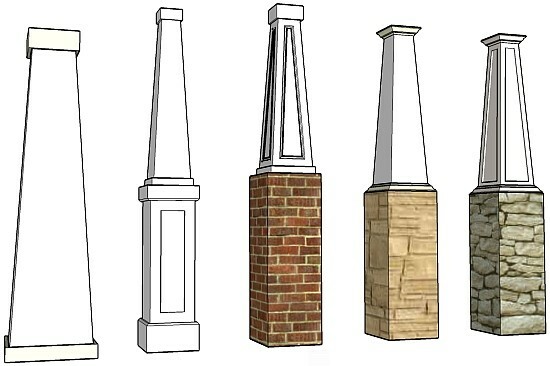 The Georgian is our most popular and unless specified otherwise, will be shipped with your column. Note that the Georgian base set is the thinnest and therefore allows for the maximum shaft size for both the top and bottom measurements. Tip: Never cut the top of the shaft, this will make the Capital too small for the remaining shaft. If cutting is required, cut from the bottom which will make the shaft smaller. The base can easily be cut down on site.